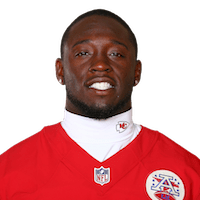 Published: Sept. 16, 2018 at 01:20 p.m.
Kansas City Chiefs wide receiver and kick returner De'Anthony Thomas shows awarness recovering bobbled football on long punt return. Published: Sept. 9, 2018 at 06:06 p.m.
Kansas City Chiefs wide receiver De'Anthony Thomas takes a shovel pass in for a quick 1-yard touchdown. Published: Aug. 25, 2018 at 03:29 p.m.
Kansas City Chiefs wide receiver De'Anthony Thomas slips through several Chicago Bears defenders on this 36-yard punt return.